and saddle ties. However, as a professional, you should be familiar with all six types. SNAP, OR SIMPLE, TIE. - The snap, or simple, tie (view A of figure 7-20) is simply wrapped once around the two crossing bars in a diagonal manner with the two ends on top. The ends are then twisted together with a pair of side cutters until they are very tight against the bars. Finally, the loose ends are cut off. This tie is used mostly on floor slabs. WALL TIE. - The wall tie (view B of figure 7-20) is made by taking one and one-half turns around the vertical bar, then one turn diagonally around the intersection. The two ends are twisted together until the connection is tight, then the excess is cut off. The wall tie is used on light vertical mats of steel. DOUBLE-STRAND SINGLE TIE. - The double-strand tie (view C) is a variation of the simple tie. It is favored in some localities and is especially used for heavy work. SADDLE TIE. - The wires of the saddle tie (view D) pass half way around one of the bars on either side of the crossing bar and are brought squarely or diagonally around the crossing bar. The ends are then twisted together and cut off. SADDLE TIE WITH TWIST. - The saddle tie with twist (view E) is a variation of the saddle tie. The tie wire is carried completely around one of the bars, then squarely across and halfway around the other, either side of the crossing bars, and finally brought together and twisted either squarely or diagonally across. The saddle tie with twist is used for heavy mats that are to be lifted by crane. CROSS, OR FIGURE-EIGHT, TIE. - The cross, or figure-eight, tie (view F) has the advantage of causing little or no twist in the bars. 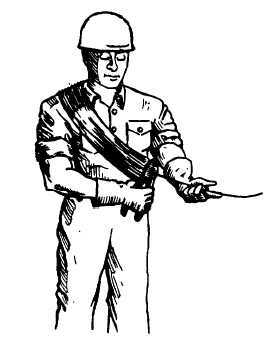 CARRYING WIRE. - When tying reinforcing bars, you must have a supply of tie wire available. There are several ways you can carry your tie wire. One way is to coil it to a diameter of 18 inches, then slip it around your neck and under one arm (figure 7-21). This leaves a free end for tying. Coil enough wire so it weighs about 9 pounds. Another way to carry tie wire is to take pieces of wire about 9-inches long, fold them, and hook one end in your belt. Then, you can pull the wires out as needed. The tools you use in tying reinforcing bars include a 6-foot folding rule, side cutters, leather gloves, 50-foot tape measure, and a keel crayon, either yellow, red, or blue.